Henri de Ricqlès, a young Dutch merchant arrived in Lyons in 1824. Passionate about botany, he was particularly interested in the peppermint, a plant which he believed to have powerful properties. Through study and experience, he obtained fresh mint by distillation. This is an exceptional essential oil that retains its active substances when mixed with a high percentage alcohol: “mint alcohol was created in 1938”. This is the essential oil contained in small quantities in fresh Peppermint leaves (Mentha Piperita), which gives the oil its beneficial properties and fresh, potent, mint fragrance. Ricqlès’ method was based on extracting this precious essential oil without denaturing it. Involving no solvents or synthetic active substances, this tried and tested technique respects the delicate natural active substances (menthol and menthone) and preserves their purity. This is why Ricqlès essential peppermint oil is unique. 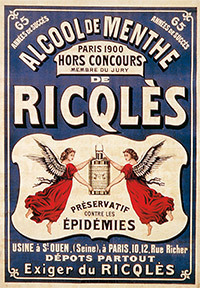 Ricqlès with its brand name symbolising two angels, nowadays puts its freshness expertise and remarkable ingredient to good use in routine everyday situations by offering a range of products for fresh breath: toothpaste, mouthwashes, dental floss, fresh breath capsules, chewing-gums and tablets.